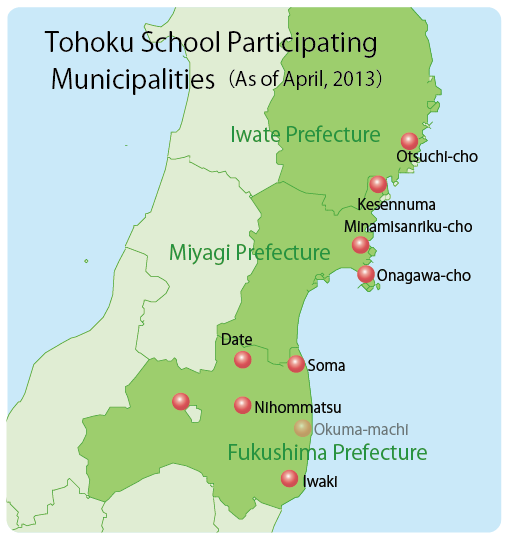 On 11 March 2011, the entire Tohoku region was hit by a powerful earthquake, followed by a massive tsunami. This disaster caused an enormous amount of damage and left an estimated 20,000 people dead or missing, mainly in the coastal areas. On top of that, there was a hydrogen explosion the following day at the Fukushima Daiichi Nuclear Power Plant, operated by Tokyo Electric Power Company, leading to the largest nuclear accident ever to occur in Japan. In April of that same year, the Secretary General of OECD (Organisation for Economic Cooperation and Development, headquartered in Paris) came to Japan and made a commitment to support the recovery efforts in Tohoku. In cooperation with Japan's Ministry of Education, Culture, Sports, Science, and Technology (MEXT) and Fukushima University, they created the “OECD Tohoku School” (an education recovery project commissioned by MEXT). 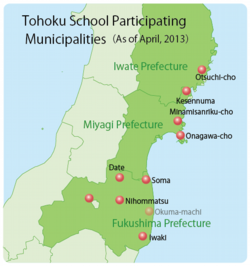 OECD Tohoku Schools is a two and a half year project, in which 100 junior high and high school students from disaster areas in Fukushima, Miyagi, and Iwate Prefectures come together for a programme of study at Intensive Workshops and Local Schools. 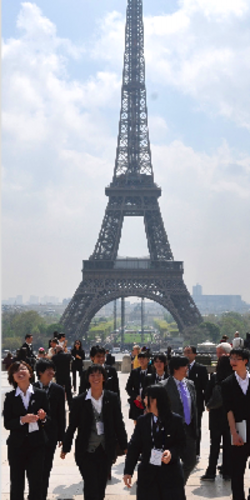 Through this project-based learning, the students will produce an event in Paris in 2014 to appeal the wonders of Tohoku to the world. Support for the project comes from MEXT, local boards of education, NPOs and related organisations. The secretariat office is located at Fukushima University. In addition, there is an advisory board to provide guidance for various aspects of the programme. The project is managed by Fukushima University. The OECD Office for Education incorporates previous education and recovery examples from other countries, and, building on them, designs the core curriculum. This project is not limited to recovery; we are also thinking about the "new Tohoku, Japan's future," including business and economic revitalisation in the Tokhoku region, and development of human resources needed for innovation. To accomplish that, we are engaged in various projects to encourage children to be independent, to help them think about the region's recovery and put their thinking into practice, and to foster innovative ability. For example, in children we work to develop the abilitiy to lead, to make plans, to be creative, to think critically about construction projects, to put ideas into practice, to negotiate, to work well with others, and to be internationally-minded. In our present-day global, diverse, knowledge-based society, we call these the "OECD key competencies for the 21st century." In order to foster the perseverance which people will need for a long-term recovery, this will not be just a one-time event, but learning through a two and a half year program me. Hold five workshops (each about one week long), with lecturers from a wide range of backgrounds, hands-on workshops, and discussions. These general meetings are for all participants, with participants from each region and school attending as a team, headed by the adult leaders from the region. In the time between Intensive Workshops, Local Schools will be held in each region to plan and enact projects for recovery, according to the local situation. The Local Schools will, in part, consist of weekend activities and general study, and after school activities to be held about two times a month. To ensure the success of the Paris event, we will conduct dynamic inter-regional activities to focus on the following topics: "scenerio," "cooperation with industry, government, and academia," "communication and PR," and "self-documentary." The final goal of the project is an event to appeal the recovery of Tohoku to the world. Our aim for this is to have a wide variety of people cooperate in this event and on their own, plan the content of the event, conduct fundraising and publicity activities, and keep a record of what they do. We ask for your donations of working funds at the OECD Tohoku School. 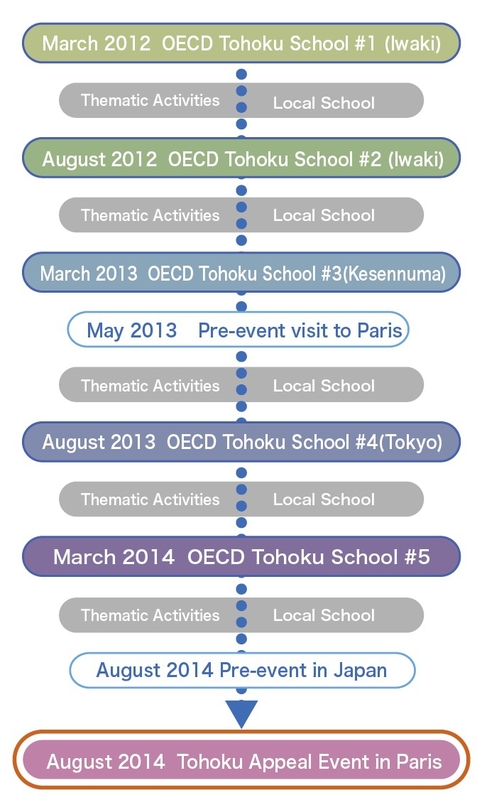 Contribution is transferred to the account only for the OECD Tohoku school established in Fukushima University. since 2013-07-13 / Copyright 2013 Fukushima univ.. All Rights Reserved.